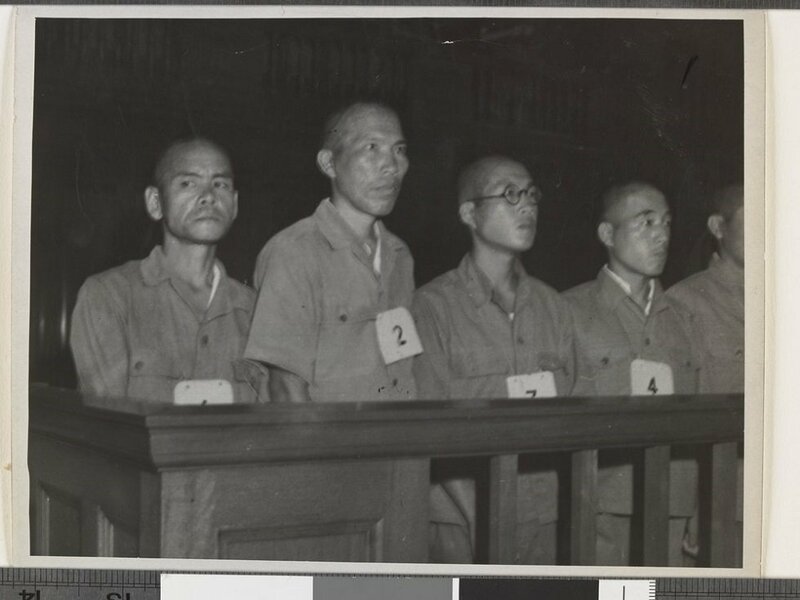 Japanese prisoner Captain Gozawa Sadaichi and others accused of brutalities against Indian POWs during the first trial of Japanese war criminals in Singapore, January 1946. Image courtesy of Argus Newspaper Collection of Photographs, State Library of Victoria. 20 April 1943 - 10 September 1945. 27 April 1944. 25 April 1945. While in charge of Indian prisoners of war, the defendants Gozawa, Nakamura, Okusawa, Kajino and Ono failed to provide food, clothing and medical attention those prisoners under their care. They also permitted, abetted and took part in the beating, overworking and general maltreatment of the prisoners. As a consequence, the victims contracted diseases and were otherwise weakened in health. A number of them died. 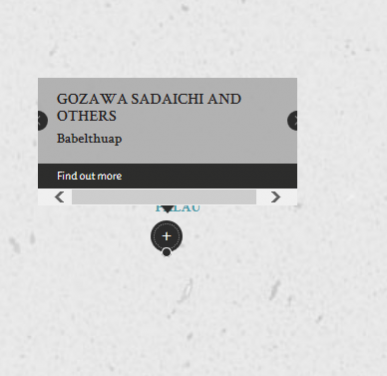 The defendants Gozawa, Nakamura and Chiba conspired to execute, and did execute, an Indian prisoner of war by beheading. The defendants Gozawa, Nakamura, Tanno, Yabi, Osaki and Ashiya flogged and otherwise maltreated Indian prisoners of war who were in their charge at the time. Eight of the victims died of their resulting injuries. This was the first war crimes case in Southeast Asia Command. Gozawa, Sadaichi. Captain. From Japanese military. From Japan. Guilty. 12 years' imprisonment. Sentence confirmed. Nakamura, Kaniyuki. Lieutenant. From Japanese military. From Japan. Guilty. Death by hanging. Sentence confirmed. Okusawa, Ken. Captain. From Japanese military. From Japan. Guilty. 2 years' imprisonment. Sentence confirmed. Kajino, Ryuichi. Lieutenant. From Japanese military. From Japan. Not guilty. Finding confirmed. Tanno, Shozo. Sergeant Major. From Japanese military. From Japan. Guilty. 3 years' imprisonment. Sentence confirmed. Ono, Tadasu. Warrant Officer. From Japanese military. From Japan. Not guilty. Finding confirmed. Yabi, Jinichiro. Sergeant. From Japanese military. From Japan. Guilty. 3 years' imprisonment. Sentence confirmed. Osaki, Makoto. Corporal. From Japanese military. From Japan. Guilty. 5 years' imprisonment. Sentence confirmed. Ashiya, Tomotsu. Corporal. From Japanese military. From Japan. Guilty. 5 years' imprisonment. Sentence confirmed. Chiba, Masami. Lance Corporal. From Japanese military. From Japan. Guilty. 7 years' imprisonment. Sentence confirmed. Lazarus, R.S. Lieutenant Colonel. From British military. Barrister at law. Sleeman, S.C. Lieutenant Colonel. From British military. Barrister at law. Fairbairn, A. Major. From British military.